Toronto, Ont., Canada – Alex Baron backed up his performance yesterday, when he claimed his first Indy Lights Presented by Cooper Tires pole, by securing an exemplary victory in this morning’s Grand Prix of Toronto. 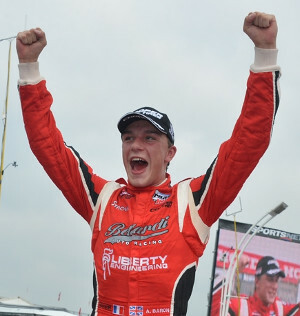 Baron maintained his advantage over championship-leading Belardi Auto Racing teammate Gabby Chaves at the start, running slick Cooper tires on a damp but rapidly drying track, and quickly pulled out a margin of over two seconds. Chaves narrowed the gap inside the final 10 laps before Baron stretched his legs again toward the finish to take the checkered flags 1.2358 seconds clear aboard the #4 Liberty Engineering/13th Avenue Dallara. The two Belardi cars romped away in the early stages, with Jack Harvey (Schmidt Peterson Motorsports with Curb-Agajanian ) more than five seconds in arrears after less than 10 laps around the challenging 1.755-mile, 11-turn street circuit. Harvey, in turn, had his hands full with Andretti Autosport teammates Matthew Brabham and Zach Veach, who exchanged places a couple of times inside the first three laps before Brabham asserted himself in fourth place. The race soon settled down with Baron circulating a couple of seconds clear of Chaves (#5 Marca Colombia/Coldeportes), then a lengthy gap to Harvey (#42 Racing Steps Foundation) and Brabham (#83 United Fiber and Data/MAZDASPEED), who were gradually edging clear of Veach (#26 RePLAY XD/The Young Marines/Ads IT Solutions/Zakosi Data Back Up). Right around half-distance, however, Harvey began to make up some ground on the two leaders. The gains were gradual at first, then more dramatic as Harvey – still chased by Brabham – began setting a series of fastest laps. For a while it looked as though the climax of the 40-minute race might feature a three-car battle for the lead. But Baron had other ideas, stretching a second or so clear of Chaves, who instead of chasing his teammate suddenly had to be more concerned about holding onto second place from the charging Harvey. He did, by just 1.5903 seconds. Brabham was a further 7.7825 seconds back in fourth, with Veach a distant fifth. Local driver Matthew Di Leo, from Barrie, Ont., made an impression in his first race of the season aboard the #56 Solmar Development Corporation/MDL Racing car, finishing a strong sixth ahead of Juan Piedrahita, then Schmidt Peterson teammate Juan Pablo Garcia who finally found a way past Scott Anderson (Fan Force United) after a race-long battle. The one-two finish for Belardi Auto Racing vaulted the Brownsburg, Ind.-based outfit right back into contention for the coveted Team Championship. Andretti Autosport has moved ahead of Schmidt Peterson by a two-point margin, 242-240, with Belardi now just a further two points in arrears with five races remaining. Garcia earned the RePlay XD Move of the Race Award for his pass of Anderson on Lap 26 in Turn Three. Additional contingency awards included a customized Race Energy BCM21 charger – the official battery of the ladder series – to the winning team, Belardi Auto Racing. Chaves now leads Veach by 21 points in the drivers’ standings, 356-335, as the series heads next to Mid-Ohio Sports Car Course for a double-header event, once again in support of the Verizon IndyCar Series, on August 2/3.